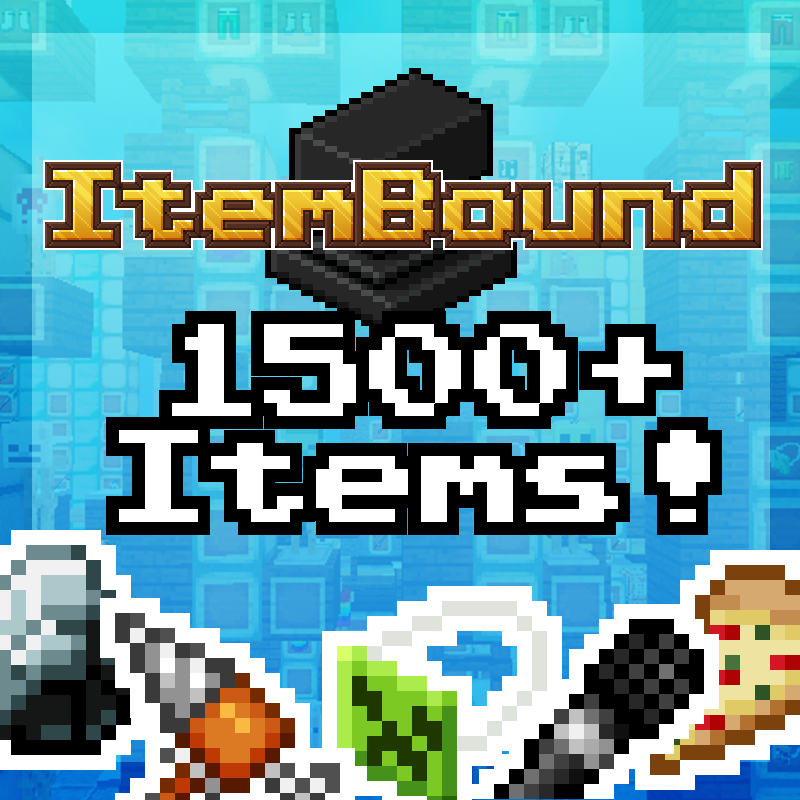 Welcome to ItemBound! A Minecraft resource pack that allows you to customize the appearance of your items by changing their display names and/or enchantments. The pack has hundreds of item skins, with plans to grow over time. Got a question/problem/suggestion? Read the FAQ. This pack requires OptiFine 1.11.2 HD U C2(or higher) in order to work, as it relies on the mod's CIT features for the items to change texture. This is a pack that I first thought of when I discovered MCpatcher back in summer of 2014. The goal was to try and come up with a resource pack that could provide a wide variety of item camos to the player, and for it to be usable almost anywhere, be it singleplayer survival or any minecraft server, all while being as non-intrusive to vanilla gameplay as possible. For an easier time using the 1.13+ crafting guide, download a PDF viewer such as Acrobat Reader that supports bookmarks. This resource pack also contains custom loot and mob drops, which can be implemented into your world through the use of the provided optional custom loot tables. Some highlights among regular mob drops include creeper hides, a plant-based alternative to leather, undead bacon drops from zombie pigmen, and rare cursed diamonds that drop from burning witch mobs. Q: Do I really need Optifine? A: Yes. This pack will not work without it. Q: I don't want to download Optifine because it will give me a virus! A: Optifine will not give you a virus. It is not malicious. Unfortunately the download links for it display ads that can sometimes be malicious. Do not click on the ads. Wait for the timer end and then click "Skip ad." Alternatively, just use the mirror link to get a direct download and skip the ads entirely. Q: Can you make a version without Optifine/for Pocket Edition/Win10/Console? A: No, this is currently impossible. Q: Can you make this into a mod? A: No. I have no experience creating mods, and the point of this pack is to add custom cosmetics while keeping your world vanilla. Making it a mod would defeat the purpose. Q: Can you make custom crafting recipes? A: I'd have to say no. It'd be too much work because of the sheer volume of crafting recipes I'd have to make, and the potential for exploits. I do have plans for other custom crafting packs though. Q: Can you make item frames invisible? A: I'd rather not. The point of this resource pack is to not be intrusive to regular gameplay. Making item frames invisible would affect some builds. I also can't make item frames selectively invisible as there isn't any support for that and they can't be renamed. Q: How do I install the loot tables? A: There's installation instructions in the zip file. Basically, open up the zip file, and copy the loot_tables folder into the data folder of your minecraft save. Q: How do I install Itembound? A: You copy it into your resource packs folder. Q: The resource pack isn't working for me! A: Provided you've installed Optifine, go to Options > Video Settings > Quality and check to see if Custom Item Textures is turned on. Also remember that you actually have to rename the items according to the crafting guides in order to see the different textures. I can't help with much else beyond that. If the pack is set up properly and none of the textures are working, it may be an issue with Optifine on your computer. Q: Banner shields are broken! A: Unfortunately the shield model that works with custom item textures breaks banner shields. If you want banner shields, you'll need to download the version without shields. Q: I have an idea for a new item! Can you add it to the pack? A: I'll do my best. Not all items can be modified like this though! Currently I can't make custom boats, saddles, horse armor, llama decorations, projectiles(arrows, snowballs, eggs, splash potions, etc), clocks, compasses, music discs, maps, leads, or *most blocks. I also want to avoid adding several items from popular IPs (shows, anime, games, etc). I'm not familiar with every series out there and it might get a little hectic having to research a bunch of different shows just to add one or two items. *Newer versions of optifine do support custom block textures for Beacons, Enchanting Tables, Furnaces, Dispensers, Droppers, Hoppers, Brewing Stands, Chests, and Shulker Boxes. That's it though. Custom blocks don't work in multiplayer. Q: Why haven't you added my suggestion yet? Did you forget? A: I've got my own release schedule and I also get quite a few suggestions. I'll get around to it, but please be patient. A: Right now, ItemBound is technically compatible down to 1.9, however because of some changes in how models are displayed in item frames, stuff like furniture won't display properly in versions under 1.11. Q: Can you give me access to the crafting docs? A: No. I'm not sure why you would need it in the first place. If you're looking to post suggestions, just send me a PM or post it here. Q: Is there a map I can download to preview everything? A: Not currently. I've tried to make one but it's hard to come up with a format that makes it easily expandable, and the amount of entities on a map like that would cause a lot of lag anyways. Previews of all the items are in the crafting guides though. In the eventual 1.14 version of your resource packs (Itembound [16x], TransMobifier etc. ), will the textures match JAPPA’s new textures? Were the Homestuck items removed? I wonder if it is possible to make invisible beacon beams? I would assume that you can't do that by renaming the beacon but maybe we could have an addon for brown glass to turn the beacon invisible? How do you get 1.13 loot tables to work because it seems the world is loaded different than 1.12, because following the instructions doesn't work on 1.13 and the files are also in different places. Is there anyway to fix this? will you ever add costume crafting table recipes for 1.13+? Hi SixFootBlue! I have a concern I am getting a huge error log when trying to run the pack along with not being able to use any of the items in the pack (invisible item frames work fine) here is a paste bin link to my issue! https://pastebin.com/KvCxT72F Thanks for the support! How do you make texture packs like this? I want to make one to use on a roleplay server. There's several resources online. Optifine's website has a link to its documentation on the main site, and Uncle Jam has a bunch of youtube tutorials. Could I ask a more specific question on the subject that I've been wondering about? How do you get your custom items and models to recognize their associated texture within the same folder? Say a dresser seeing that the texture it needs is in the same custom folder as well. I've read through the documentation a few times, looked up what information I could and studied the properties files that your project has. I even tried out three diffrent modeling softwares expecting it to be an issue within the creation of the .json file but all three result in the same: black and purple textures ingame no matter what. If I place the custom tecture in /blocks it renders fine, but if it's in the folder it is supposed to be in the game does not seem to be able to handle it despite me pointing at it as it's source location in the model creation. Even though the file struckture of your folders is proof that the game is in fact capabe of it - in theory. I am obviously missing some key element in the finalizing somewhere but after a little over a month of trial and error I'm at a loss. Is there an additional piece of informatin I need to add to the json file after I am done or a special form of exporting the file or anyhting of that kind? If you have any ideas or suggestions on what I could be doing wrong or any pointers to information regarding how to get files to see each other within the same structure or really anything I'd be imensely grateful. Either way, thank you for your hard work over the years on this project and inspiring me to follow your path. Even with this frustrating issue I've had a great time creating and bringing custom items and objects to life within Minecraft with this recouce pack magic. Where filename is the name of your texture file. (minus the .png part at the end). Oh...my god. So all I was missing this entire time was the dot in front of the filename instead of listing the folder. I just knew it would be a very tiny but incredibly important detail like that haha. Now it works as intended. In the latest version, the toilet textures are bugged out. If you can can you fix it blue? this resource pack has copyrights? Anything anyone makes themselves weather in a group or alone, is copyrighted by law unless under the Creative Commons License (Royalty free). Though you can be given permission to use, which then has to have credit to the creator unless the maker doesn't mind if they get credit or not, and can not be claimed as your own. The textures used in this pack are copyrighted, but you are allowed to use the .properties files because it's optifine's (Unless you use it in another game besides minecraft).